Since 2008, we have worked on more than 70 projects focused on narrative and sensemaking in complex environments. We bring an intimate understanding of how to make this approach work for you, whether as an advisor, mentor, or manager. Advising: You may be prepared to run your own narrative project, but need some assistance. We can help with overall guidance, instrument design, software implementation and data collection, report creation, engagement with the story data, and understanding your constituents. Mentoring: If this is your first time using these methods and software, we can work with you and make sure you understand and are comfortable with each step in the process. In addition to advising you with each step — design, collection, reporting, interpretation, and so on — our goal would be moving you to full independence for future projects. Managing: Perhaps you have read about narrative and the sensemaking methodology. Your organization has a problem or situation where you see this as one solution. We can help you assess the applicability. If it seems like the right approach for you, then we can run the entire project for you. Defining a project: Some clients want to get their feet wet first. 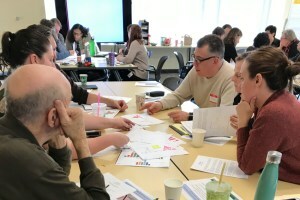 They suspect that narrative could be useful, but rather than organize for and invest in a full study, they decide to conduct a workshop-based activity, such as an “anecdote circle,” with some of their constituents first. We can suggest appropriate structure and methods for this and run it on-site for you, or work with you so that you can do it on your own. Extending a project: Most clients find that a one-time snapshot of their respondents’ stories and other data is adequate for problem solving. But some find that “punctuated capture” or another form of repeat storytelling, by the same or different participants, gives a valuable timeline of changing perceptions and feelings. We can help you set up an ongoing dashboard system to monitor such changes and guide you in assessing what they mean.